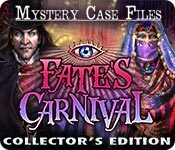 Mystery Case Files®: Fate's Carnival Collector's Edition is rated 4.4 out of 5 by 381. Rated 5 out of 5 by brilliantmistake from Best in Series This is my favorite game in the MCF series. Intersting storyline and graphics, good length, challenging puzzles plus lots of extras. I especially like the mimi-bbok of puzzles that added clues and games as you progressed. The door puzzles were particularly creative. Rated 5 out of 5 by aljora from Awesome and amazing! This game will give you hours- no- make that days of playing! Hidden Bobble Head dolls in the rooms, morphing playing cards in the HOS sequences, and money to collect in the Investigative close ups! You can use the money to decorate your helper's room! Isis is the cat to call on, to get hard to reach items, in tight spots. This game has some excellent and difficult puzzles, not usually found in other HO games. Well worth the CE, with lots of bonus content. Rated 5 out of 5 by lillika from An AWESOME GAME!! I've only given 5 stars to 2 games. I loved this game! It was so much fun!! The storyline (which I usually hate) was minimal -TG! and when you had to endure it you generally received a reward. I loved all the mini-games, a lot were interactive, and especially loved the inter-active dioramas. The artwork was great! This game was LOVED by it's designers; some one took a lot of care and time. This production team were artists! Done in old timey style reminiscent of the early carnivals; they didn't take themselves so seriously. Every type of mini-game was represented! One of the very few games I didn't want to end!!! highly recommended! What FUN!! Rated 5 out of 5 by teralinda from Best Game Ever!!! I've never rated a game before, but felt this game needed it. I loved, absolutely loved, the super puzzles in this game. I wish other games had them. Rated 5 out of 5 by julie500 from THE BEST I have played many games (over 200) and yet this is still THE BEST GAME EVER!!!!!!!! I have written hardly any reviews but i had to write one for this. Rated 5 out of 5 by 10_cardhu from Very challenging game! If you're looking for a game that is value for money, this one is it. As a seasoned true adventure game player from way back, even I struggled with this one (in a good way!). Not only are the graphics, sounds, etc fantastic, the gameplay is one of the best I have experienced on BFG. LOADS of adventure, puzzles, mini-games, etc. Really interesting and some quite difficult. Hours and hours of gameplay. You absolutely must buy the CE, the bonus chapter alone is the length of some normal games!!! Rated 5 out of 5 by Jillibean from Challenging and Fun I love the MCF and always buy them as soon as they are released. This one was another winner! It follows the story of the Ravenhearst mystery and Madame Fate's Carnival. The HOS and puzzles were challenging. The graphics are beautifully done. Keep it up MCF...can't wait for the next installment! Rated 5 out of 5 by quietwizard121 from Best MCF Ever This game gives you a LOT for your money. Whereas games in this genre in general have five or so distinct chapters or quests, the basic game has many more and the bonus chapter too is packed with gameplay. The HOS are held to a reasonable amount and include clever twists on the concept to make them more interesting and challenging. The "boss puzzles" are truly something, each having its own internal hint system and requiring a lot of thinking outside the box and patience. I found many hours of straight on enjoyment with this one, a real winner for the franchise. 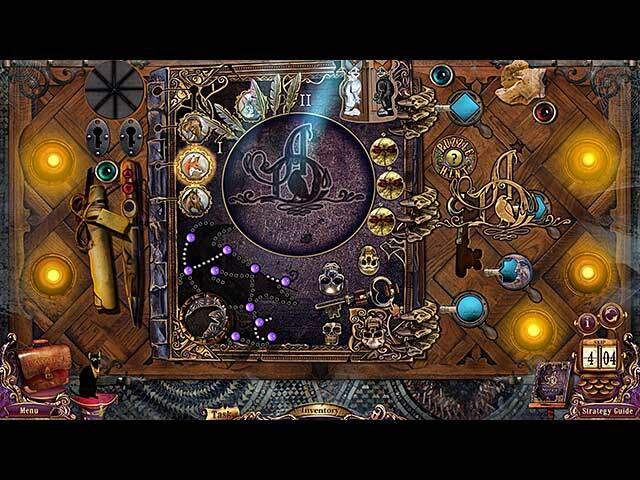 Rated 5 out of 5 by vmtino from None better Mystery Case Files Games are the best games ever. I have yet to find any better overall games than this series. I own all of these games and can't wait for the next one to come out. The artwork is excellent and never looks cartoonish. Objects are superbly hidden and not just placed as an afterthought. Story line is always good and love the ability to get around without the need to click through each area individually. THE BEST part is the mind-numbing puzzles that are both maddening and absolutely ingenious! I love being able to discipline myself to keep thinking through the problem or go ahead and get a hint to continue. PLEASE KEEP UP THE GOOD WORK AND KEEP THEM COMING!!!!!! Thank you. Rated 5 out of 5 by Findmummy from Elephant Knows what we MCF fans want! I didn't expect to like this game because the first Madame Fate did not thrill me. But I am a huge fan of Return to Ranvenhearst and I consider that the greatest game of this genre. So it was an unexpected surprise to see this game with a great storyline that brought back the evil Dalimer's and all the weird challenging puzzles that make you go "who on earth thinks these things up???" Escape from Ravenhearst was a bomb. This gives me hope for more good things to come. Rated 5 out of 5 by MatildaRabbit from Nothing Like MCF! There are some other game series that I like, but no other game has puzzles like MCF. This game had hours and hours of game play, and I don't think I actually finished every possible puzzle that was available. Even the clue book included puzzles. I tend to be an if-all-else-fails-read-the-instructions person, so I didn't realize there were puzzles there until I'd been at it for a while. When I first started playing MCF games, I found the mini puzzles to be so difficult that I would just skip them all, but I find that I really enjoy them now, even though I do have to use the hint button quite frequently. Now I look forward to the mini puzzles and trying to figure them out. The hidden object scenes aren't so frequent that I get tired of them. There's a lot of variety here. There are different things to collect, even within the hidden object scenes; I didn't catch on to this immediately, so I think I missed some cards. I'm looking forward to the next MCF! Rated 5 out of 5 by Kat90_ES from Holy Snap!! This was hands down THE BEST MCF game I have ever played! I loved the length of the game and the twists and turns and how there was ALWAYS something to do. I especially loved the dark theme of it as it put me in the mind of Dark Strokes: Sins of the Father CE, (which was an awesome game as well). Very fun as I would up playing it twice, (not including the extra gameplay). I cannot wait for another MCF game! Rated 5 out of 5 by Mrs_Kim from Elephant Games save the MCF series! 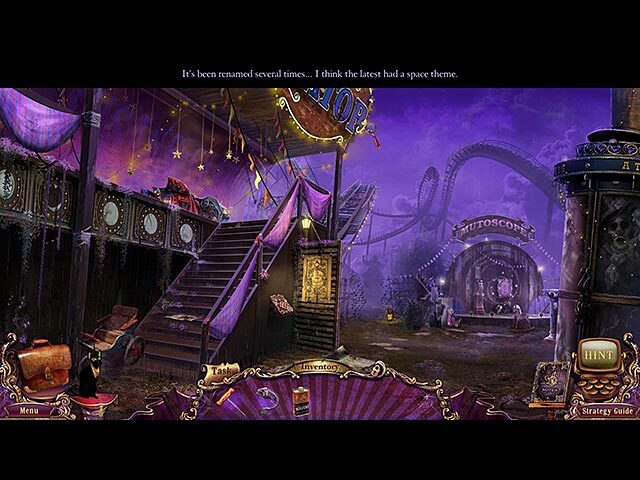 The tenth game in the series of Mystery Case Files by Elephant Games ----------------------------------------------------------------------------------------------- MCF is usually made by BFG Studios but this time round Elephant Games carried on, which at first made me worried, although I like EG, I love how BFG made the series (except the previous one, Shadow Lake which is a flop) creepy and very spooky. I never encounter any creepiness in any EG game so far. However I was wrong. 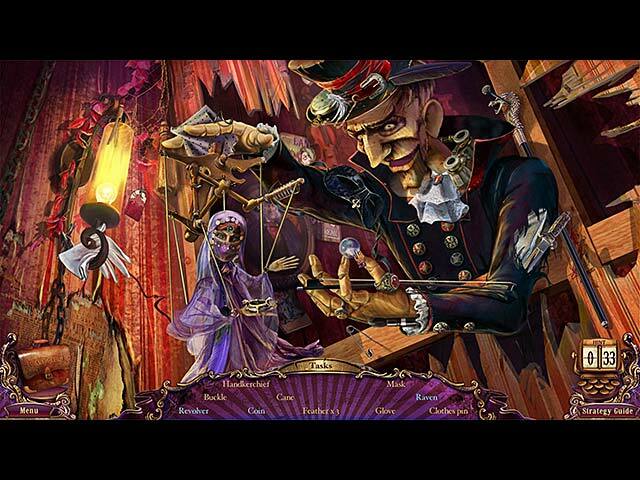 EG delivers an wonderful sequel to Madame Fate game and aside from abundant creepy factor (except those scary clowns! ), the whole game is perfect. Great MCF music, animation, superb graphics with 5(!) difficulty levels, that's awesome. If in Mystery Trackers (MT) games you get Elf the dog, in this game you get Isis the cat, which is as helpful as Elf. It's like having a very trustworthy assistant. The hint also teleports you like a map, to the point where you have current task. Very helpful for me as a Beginner. The puzzles are various, but the simple one take requires 1:30' before you can skip and complicated one requires 5:00' to skip. Bonus section is a charm in itself, very diverse and have lots of nice things. There are games, collectibles, and so on. Secret Room is my favorite. The bonus chapter is also a great play, and let you finish off what is done at the main game. A wonderful game overall. I hope they will continue next, as they advertise on the game's main page. Rated 5 out of 5 by LadyEM48 from WOW! Give us more! Five stars are not enough for Fate's Carnival! Welcome to the "other side" Madam Fate's Carnival, Step this way to an adventure that challenges any level of expertise, in ways you may never imagine. Don't be shy folks, that tingle down your spine is only your nerves .. or is it?! This updated version of the old classic is in a class of its own. We are transported to the remains of Madame Fate's carnival which lies in tangled ruin. Our challenge is to rescue the Magician, mermaid, strong man, and other members of the, who are locked in hideous devices of torture, between life and death. Where the original failed to challenge us, this updated game has us going from one known area of the carnival, and introduces us to new characters, who were only hinted at in posters, or only a name. Rated 5 out of 5 by sunlesssea from Best so far Dire Grove and Return to Ravenhearst have been my favorite from this series. Now I have one more to add. I really like the extra features in the collectors addition. The puzzles where just the right amount of challenging, and I adore Isis. The story was fun aswell. Rated 5 out of 5 by zpg1957 from Wonderful puzzles, great game This is an echo of the original Ravenhearst, with the clever, witty little games in an HOA/puzzle format. One of the best games ever. Rated 5 out of 5 by nosixx from The Best I've Played All Year I enjoyed every minute of time I invested in this game. It was challenging without dampening your enthusiasm when you ran into parts that stumped for a bit. I'm especially fond of the lateral thinking puzzles. You won't finish it quickly and you'll be glad. If you get the collector's edition, the bonus game play will extend the fun. Oh, the art work and cut scenes are excellent. If you like fun challenges, this is the game for you. Rated 5 out of 5 by InSearchOfFun from Best Game Ever! This game hits top score in all areas of evaluation. I liked it the most because it had so many layers and games built within games. It keeps you thinking. Otlichnaya rabota (Great Job) to both the Elephant games and Big Fish teams! Rated 5 out of 5 by KeysPirate from An Epic Masterpiece worthy of 10 stars Brilliant! Amazing! Challenging! Thrilling! Immersive! This is unquestionably the best and the longest game I have ever played. It truly exceeds the normal rating system because it is at least 2 or 3 times as long as most games, not even counting the extras such as solitaire and decorating Isis' room. CAUTION: If you are one of those gamers whose goal is to "beat the game" (I hate that term... you don't "beat" a game, you complete it) as fast as you can, beware... this game will "beat" you. Not only is this a superb adventure with all the wonderful old carnival locations and characters and games, it includes several incredibly clever, colorful, puzzling, delightful multi-part games that are so much fun! Most are sort of steampunk style, with mechanical devices that you have to get working. I really had to put on the old thinking cap to solve them, and many took me more than an hour. I especially loved the Shark Fishing and the Juke Box. [Note: I played in "Swallow Hard" mode and did not use the SG, but did have to resort to a few hints and check the Forums a few times. It is so much more rewarding to figure things out for yourself, even if it takes a very long time.] The HO scenes (not very many) were very good, far better than in most other games but they pale in comparison to the multi-part puzzles. Other great stuff: NOTEBOOK. More than just notes. Don't neglect to open it from time to time. You will need it for many different purposes. MAP: You don't really need it for transportation because you can get to almost anywhere from anywhere with just a few clicks and no scene-change delays, and you may encounter new things along the way. If you are stuck, it can be helpful to guide you to places where there are things to do, but don't take that to mean you can do them NOW. And there are a couple of glitches, where places that have no available action are shown as active. CLICKS: Clicking on things that don't appear to be active can reward you with surprises and humorous comments. Sometimes you have to click multiple times before anything happens. Be aware that you must be precise in where you click in certain scenes, so if you don't get a response, click nearby. BOBBLEHEADS: Be on the lookout in all places. I missed one and while I don't care much about Achievements, I am disappointed that I didn't find them all. Before you get too far along in the game, you should check out the Bobblehead room. It might give you a clue as to locations. MUSIC: Not on all the time, but when it comes in, it is dramatic and adds to the excitement. And it does NOT repeat indefinitely. That drives me crazy. ARTWORK: I love this style... mostly realistic but with a drawn, artistic look. Amazing detail, and many truly beautiful scenes amidst the ruins of the old carnival. The animals are so real... loved the rabbit and was so glad I got to interact with him more than once. I stared at the blue hole in the grotto for a long time, just because it was pretty. TASKS: All fun, no drudgery or frustration (except that one mixed up mask puzzle in one of the later multi-part games that made me a little crazy but I finally got it). Shooting galleries are one of my favorite attractions, so I was real happy that I got to go back a few times. There was a perfect balance of finding things that you wonder where and when you might use them vs. finding things that you've been looking for. "Oh boy, another dart!" BONUS CHAPTER was as long as most regular games. And when I thought I was finished, there was more! And then more... What seems like the end is not all there is. Don't miss the Secret Room. A must buy! I hope there will be more like this. Rated 5 out of 5 by ksphinx from Great It was exciting and fun to play. Rated 5 out of 5 by Firehorse66 from I wait for these game series! The best interactive puzzles! No other game has better! Always a blast to play the Mystery Case Files games. Can't wait until the next one. Let's not wait so long please!!! These games take forever for the next one to release. Rated 5 out of 5 by 5Jodi from Wow! What a game! Great graphics, challenging - unique puzzles, twists and turns in the plot and really fun! I certainly got my money's worth on this one. Great game Big Fish!! Rated 5 out of 5 by anet54 from Best Yet If I could give more than 5 Stars, I would. I've always loved the original MCF games - especially Madame Fate and all the Ravenhurst games. This one combines them all into something amazing. Spectacular visuals, puzzles, gameplay, music, and characters. The Collector's Edition is beyond worth the extra money. I thought I'd finished the Bonus Game, when I suddenly discovered a "secret room." And the fun and games continued! This is the game that all others should aspire to. Rated 5 out of 5 by debbie_candy from excellent! strong story, amazing visual and audio effects, variety in difficulty levels, long gaming, all point to one direction: perfection!